Submitted by John Sabotta (not verified) on Tue, 2005-11-15 07:27. I realize that there is a certain nekulturny tradition to uphold here at Cattlearchy, and obviously nobody should be forced to pay for "public art" but the implication here seems to be that Schreckengost is some kind of pretentious fraud, on the same level as people who dump garbage on gallery floors and call it an "installation". Based on his website, this is pretty obviously not the case, and he also seems to have been an accomplished industrial designer, which tends to make me wonder if all the facts are available on the disintegration story cited above. Submitted by Brandon Berg (not verified) on Tue, 2005-11-15 08:43. If I'm reading the excerpt correctly, t's not a comment on Schreckengost at all. 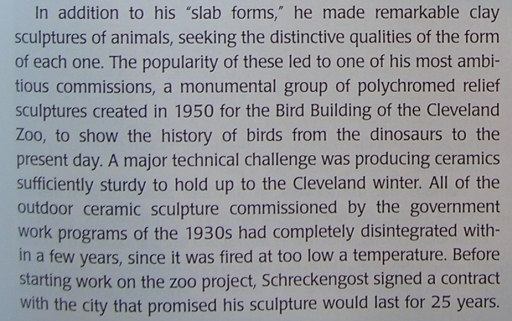 The sculptures that disintegrated were the Depression-era public works projects, not Schreckengost's. Submitted by John Sabotta (not verified) on Tue, 2005-11-15 10:31. Submitted by Greg P (not verified) on Tue, 2005-11-15 13:46. I was hoping to find a link to his Cleveland Zoo sculptures -- ?? The smaller pieces on the link's site look quite exquisite. Submitted by Greg P (not verified) on Tue, 2005-11-15 13:48. BTW, I kind of like "Cattlearchy" -- maybe something to reserve for April Fools Day. Submitted by Randall McElroy (not verified) on Tue, 2005-11-15 17:55. Ah, the lack of context. Brandon Berg is right: the comment was on the Depression-era public works projects. Schreckengost is a fantastic artist/designer and a professional. Submitted by Sean Lynch (not verified) on Tue, 2005-11-15 22:34. In addition to his "slab forms," he made remarkable clay sculptures of animals, seeking the distinctive qualities of the form of each one. The popularity of these led to one of his most ambitious commissions, a monumental group of polychromed relief sculptures created in 1950 for the Bird Building of the Cleveland Zoo, to show the histoy of birds from the dinosaurs to the present day. A major technical challenge was producing ceramics sufficiently sturdy to hold up to the Cleveland winter. All of the outdoor ceramic sculpture commissioned by the government work programs of the 1930s had completely disintegrated within a few years, since it was fired at too low a temperature. Before starting work on the zoo project, Schreckengost signed a contract with the city that promised his sculpture would last for 25 years. Submitted by Larry (not verified) on Sat, 2005-11-19 01:12. Cattlearchery - the place to shoot some bull.